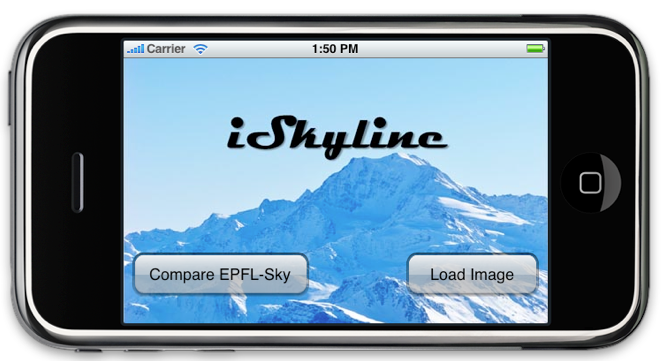 The goal of the iSkyline-Project is to develop an iPhone application that can show additional information about summits in mountain-view photographs (e.g. name, height, history, etc.). The aim of this semester project was to implement an application that can retrieve in such pictures, the line of the mountain ridge. The challenge of the project was, that the application should function under various meteorological conditions (e.g. clouds, direct sunlight, fog, snow, plane contrails) and other disturbing elements in images (e.g. strong shadows, objects in the foreground, partly overlapped ridge). The idea was to search the best path with Dijkstra's Algorithm in a gradient map of the given image. A validation was made on a series of images with favorably weather conditions. In 92% of the pictures, a good detection was achieved. While the main target was a functional application, this work will also be a good help for further Image processing projects on the iPhone.